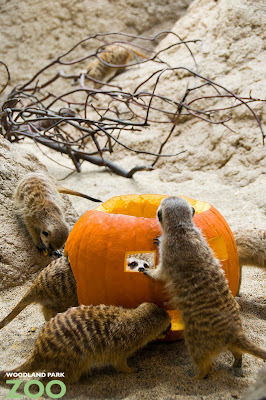 In anticipation of Pumpkin Bash, we gave meerkats and grizzlies a preview of the tasty snacks awaiting them this weekend. 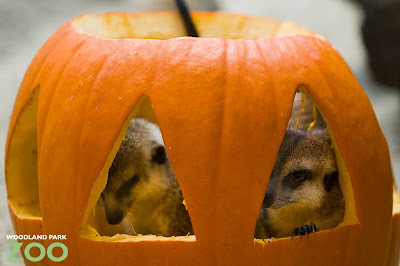 First up, the meerkats filled their bellies with pumpkin when we set out two jack o’ lanterns in their exhibit. 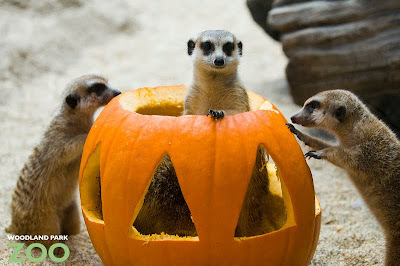 They are always quick to investigate anything new, so they scrambled immediately to check out the large pumpkins. 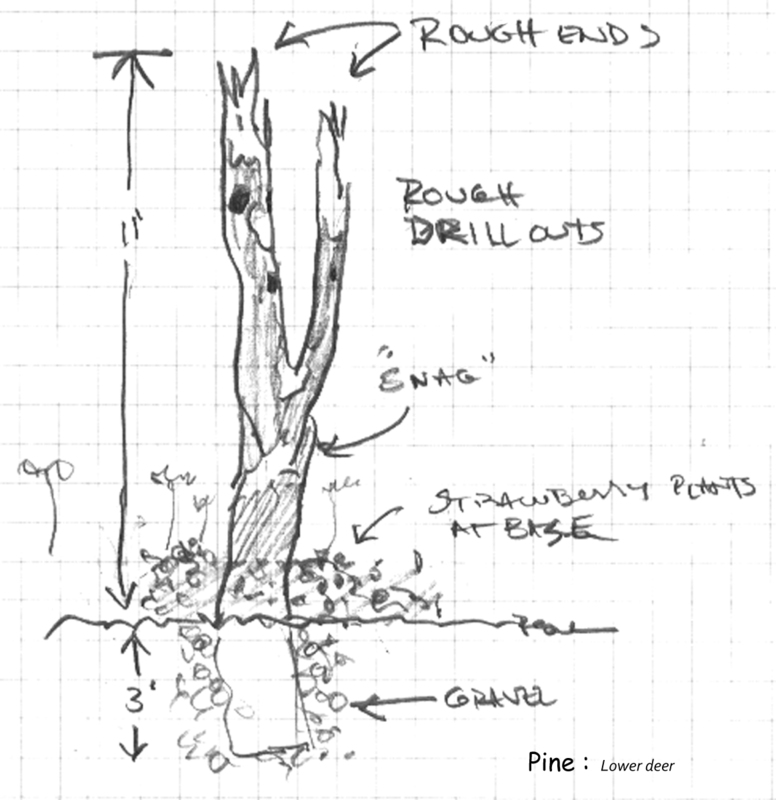 Some climbed right through the holes to get to the tasty inside, while others clawed and gnawed at the outer portion. After the meerkats stuffed themselves, the grizzlies got their turn. The pumpkins were tossed into the exhibit making an impressive splash. Our two grizzly bears, 16-year-old brothers Keema and Denali each grabbed a pumpkin and took them to their own spot. 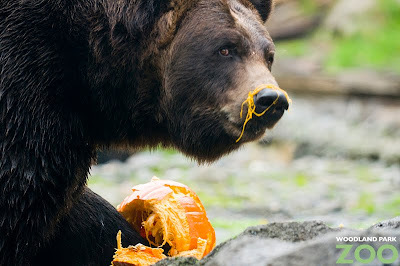 It didn’t take long for them to smash open their pumpkins and enjoy the innards, the evidence all over their faces. You can see elephants, gorillas, hippos and more enjoying pumpkin treats at this weekend’s Pumpkin Bash on Saturday and Sunday. There will also be trick-or-treating, live entertainment, and one child (12 and under) in costume gets in FREE per paying adult! If you make it down to Pumpkin Bash, we’d love to see your photos. Please share them on our Facebook wall. See you there! When the Chilean flamingo exhibit was constructed in 2007, one of our older non-animal exhibits had to go: the Our Backyard exhibit that focused on planting and caring for native, wildlife-friendly shrubs, trees and flowers. But we knew this wouldn’t be forever. We have just begun the new iteration of Our Backyard, re-purposing the small orchard in our Family Farm. Despite the new location, the focus remains to demonstrate ways to bring wildlife closer to home. We’ll share seasonal programs that show people how to offer food, water, shelter and a place to raise young for our native wildlife. We’ll also show visitors ways to help mitigate the detrimental effects of modern lifestyles ― from toxic chemicals and pesticides (Just say no! ), to keeping our pets from preying on wildlife. 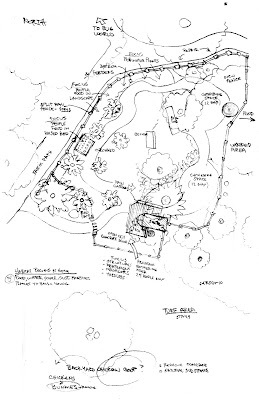 A new path will wander through a special corner of the zoo toxic free and will include drought-resistant native plants, drinking water sources, food and shelter to encourage wildlife such as bees, birds, bats and butterflies, as well as soil- building bugs. (We’ll also encourage some animals that don’t start with the letter “B”!). 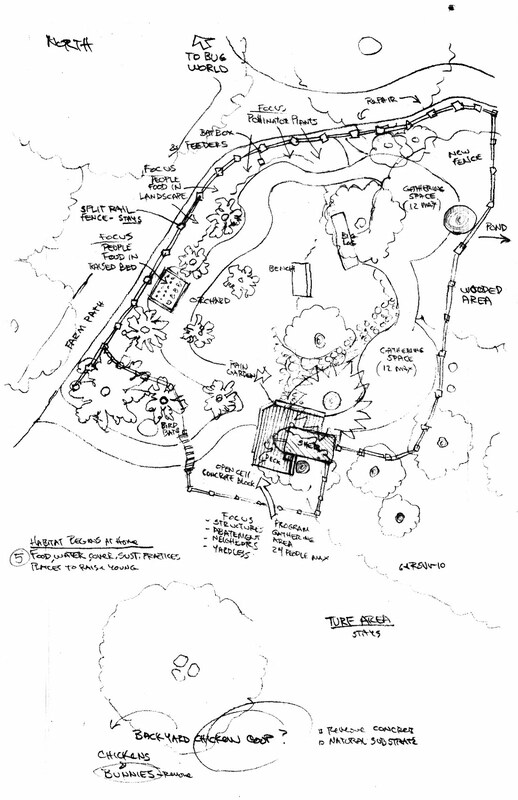 The trail will serve as a seasonal program area and a year-round interpretive path. 1) Wildlife needs water and protection from pets. 3) Pollinator Plants: Pretty and Productive! 4) We all need shelter: Wildlife shelters are easy! Many plants along the path will have tags or signs so visitors can find the same plants for their own yards. The entry to Our Backyard will feature a garden shed, which will serve as a gathering space for programs. Run-off water from the shed will pour off into a demonstration rain garden built by local Boy Scouts, while the bulletin board on the shed informs visitors of upcoming workshops and programs. 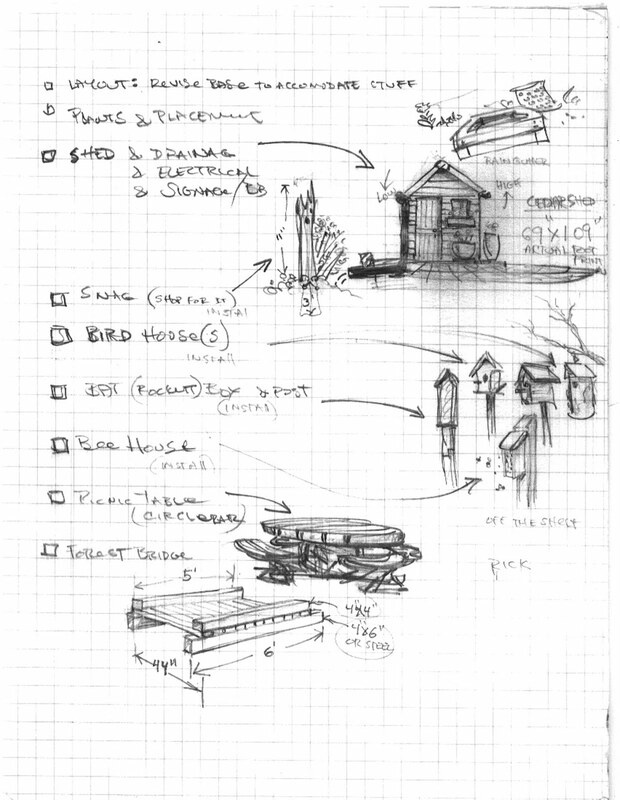 The shed will also be a convenient place to share bird lists, wildlife-watch info and other information such as how to obtain official Backyard Habitat certification for your own yard. In a brand-new partnership, Woodland Park Zoo’s horticulture team has been working with volunteers from a local Boy Scout troop to construct Our Backyard’s secret rain garden and pathway. Hidden from view for years we’ve eked out a way through the quiet little forested area used by bushtits, sparrows and barred owls. A couple of benches and a small footbridge make it welcoming to everyone. We’re pleased to have partnered with these young people on their service learning project, and we are especially excited about this exhibit because it will help us inspire our visitors to take real, measurable action to help wildlife and habitats. Do you take cream and sugar or pulverized fish and elephant poop with your tea? This isn’t Tetley’s folks! We are talking about compost tea—that mysterious concoction that has many environmentally-concerned folks thinking of alternatives to pesticides. From the inception of our Natural Care horticulture program at Woodland Park Zoo, we have approached the application of this mighty brew as one component of a system intended to support sustainable landscape management. It works in conjunction with other biology-based techniques; it is important to understand that we don’t look to its use as a cure-all for disease problems. Every Thursday morning at 8:00 a.m., I can be found unrolling a bright yellow 200 foot hose while our 250 gallon tank makes its scheduled appearance via forklift. While we prepare for our four hour spray session, the questions start coming. 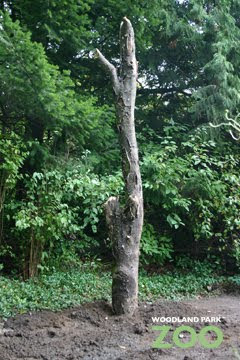 So many visitors find this all very intriguing. 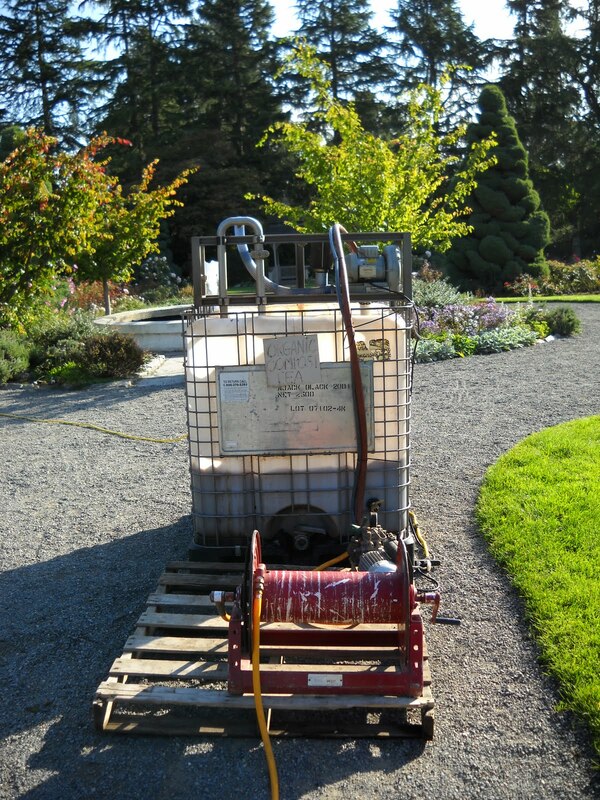 Most start with: What is compost tea? The answer: it is a blend of organic matter from a variety of sources that is either added directly to de-chlorinated tank water (as in the case of liquid ingredients), or put into an actual “tea” bag for steeping (designed for dry ingredients). The magic potion is then aerated and left to brew for 24-48 hours until the likes of tea-takers like me are ready to spray. This query is often followed by: what does the tea do? The idea behind compost tea is for desirable biological microbes (those that contribute to the advancement of an environment’s ecological balance) to take up niches in the soil and on foliage that would otherwise be occupied by disease agents. In addition, “beneficials,” as they are called, can aid plants in nutrient and water absorption and retention. When people inquire about our recipe, I first inform them that different plants/landscapes call for different biological considerations. In the case of roses, we are aiming for a tea that is dominated by beneficial fungi (which is not so easy to do as most teas are more bacteria-based). Our own unique recipe has been developed over the years to include: pulverized fish matter, Alaskan humus, fungi laden bark mulch, granular sea kelp, liquid humic acid, protozoa that has been extracted from a hay and water mixture, our famous Zoo Doo, and good old garden compost. We are regularly examining the material yielded as well as its affect on our garden to determine if changes need to be made. This brings up another point: it is vital to TEST, TEST, TEST when adding anything to a landscape; we want to know exactly how we are impacting our soils and plants. If it’s not for the better, we better rethink what we are doing! Most people get pretty jazzed about all of this and ask me how they can make their own tea. I answer: though possible, it is difficult. I recommend if one is really serious about getting the right tea for their garden, have a professional brewer/applicator come to your home. Q: Can I buy it in stores? A: Yes, it now comes in powder form, though be sure to have its viability tested. Q: Where do you get your ingredients? 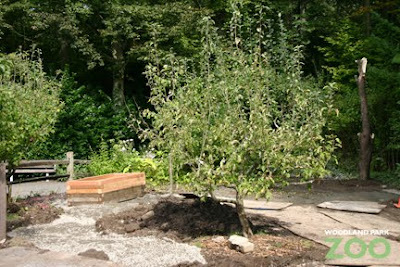 A: We make our own compost and order all other ingredients from an Oregon company specializing in tea related materials. Feel free to contact the zoo for more information. Q: Do you spray all year? A: We can, but generally begin the spray season in late February, following our hard prune, and end in late October as the garden is being put to bed. 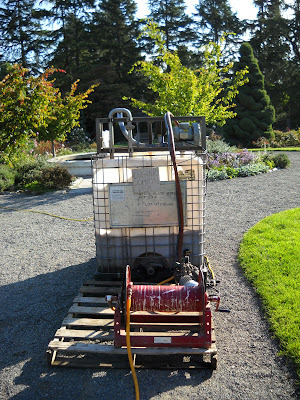 Compost tea is a relatively new idea in the history of landscape management. It is controversial and will be continually examined for its efficacy. Here at Woodland Park Zoo, we are believers. We have seen desirable results. We are committed to conservation, preservation, and sustainability. So, put the kettle on and brew up a pot! 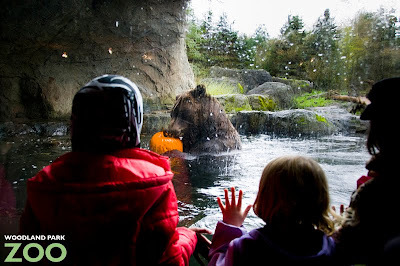 Photo by Kiley Jacques/Woodland Park Zoo. The chick’s vocalizations are actually quite important for survival. Just 5-12 days after hatching, flamingo chicks within a colony leave their nests and form a crèche of similar-aged chicks watched over by a few adults. For subsequent feedings, parents locate their offspring in the crèche through voice recognition. How do the parents recognize their chick’s voice? 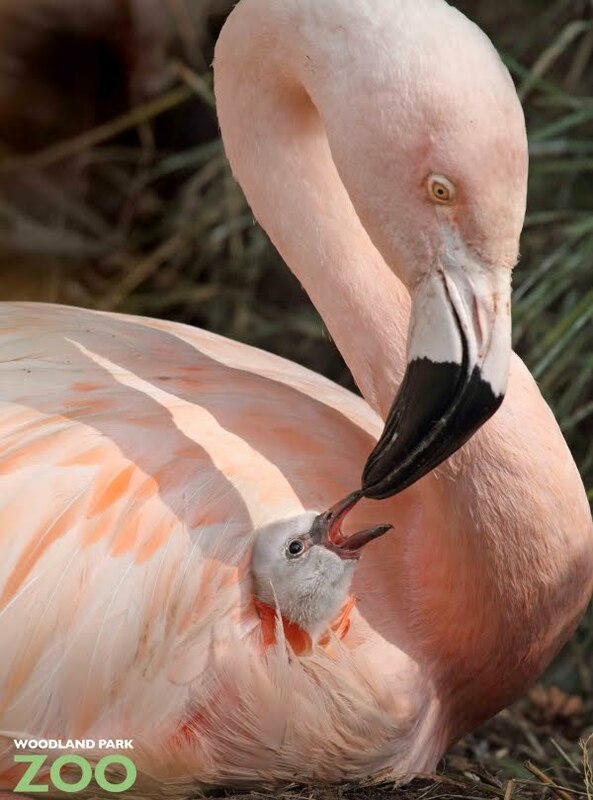 Hours before hatching, flamingo chicks begin vocalizing within the egg. This establishes a bond with their parents so they can locate each other even within a flock of thousands! Stop by the flamingo exhibit and you’ll notice two small, white puffs emerging among all those pink feathers. 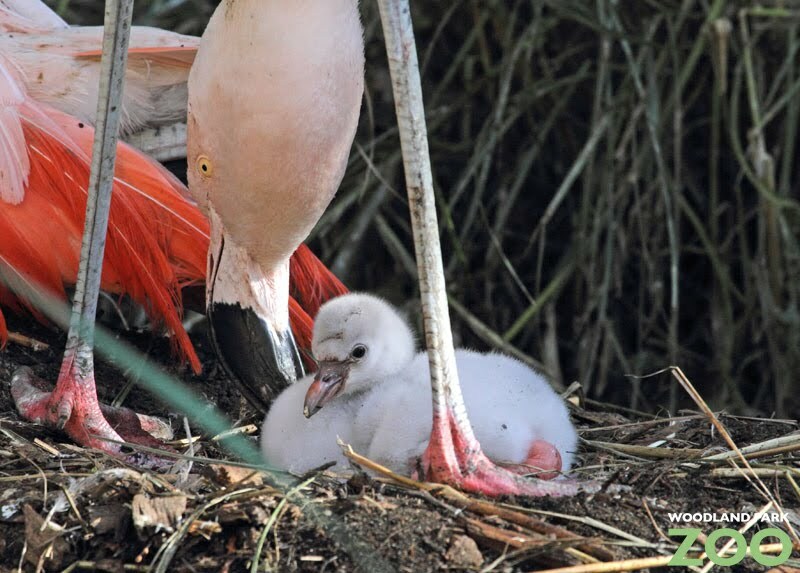 That’s because two Chilean flamingo chicks hatched at the start of October, and are being cared for now by their parents out in the flamingo exhibit. This is the first time that our colony of flamingos is raising chicks on exhibit. Last year, the flock produced three chicks which were hand-raised by the zoo’s team of expert staff before being introduced to the colony. The flock decided to breed a bit late in the year, but the chicks are well insulated and should have no problems with acclimating to colder temperatures. Chilean flamingos typically breed at very high altitudes in the Andes. So far, the parents are doing a great job of caring for their young. With flamingos, both parents care for their chick, feeding them “crop milk,” a dark red secretion produced in the upper digestive tract. The substance is nutritionally similar to milk that is produced by mammals. The chicks leave their nest about three to five days after hatching but remain in close proximity to their parents for feedings and brooding. Flamingo chicks hatch with a whitish, gray down and can acquire extensive pink feathering that can be mixed with gray-brown contour feathers at about 1 year of age. Juveniles usually have full pink feathering by 2 to 3 years of age. We’ll be watching the parents and these chicks closely to make sure the chicks remain in good health as they grow. Three more eggs are expected to hatch later in the month, so more chicks could be on the way. Connecting children to nature is essential to our mission and we do it every day on zoo grounds. But nature is all around us and we’re always excited about the opportunity to take nature lessons outside of the zoo gates and head into the community. We’ll be doing just that on Sat., Oct. 16 at Seward Park where we’ll be taking part in the National Wildlife Federation’s Hike & Seek family event—and we’d love to see you there! A cross between a nature hike and a scavenger hunt, Hike & Seek is a great way to get your family and friends out into nature and experience a local park in a whole new way. Step off from base camp after loads of activities for all ages, and use your map and mission guidebook to create your own interactive nature experience. Along the way, you’ll learn about trees, water, plants, animals and birds. Woodland Park Zoo staff will be there to guide the Stop & Study station on animals. Families will have the opportunity to solve an animal track mystery and learn how each animal has a unique footprint that provides clues about their behavior. 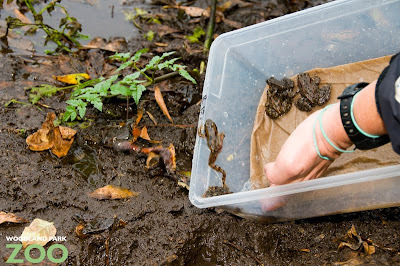 We don't always see wildlife when we explore the outdoors, but by learning to read animal tracks, we can discover the secret lives of animals in the habitats we share. 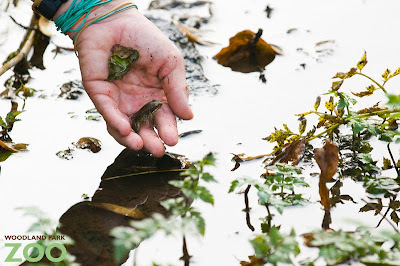 Investigating wildlife tracks is a great family activity, as it builds on children's innate curiosity about wildlife and presents interesting puzzles for families to solve together. For info on registration, fees and directions, head to www.hikeandseek.org. We hope to see you out there! 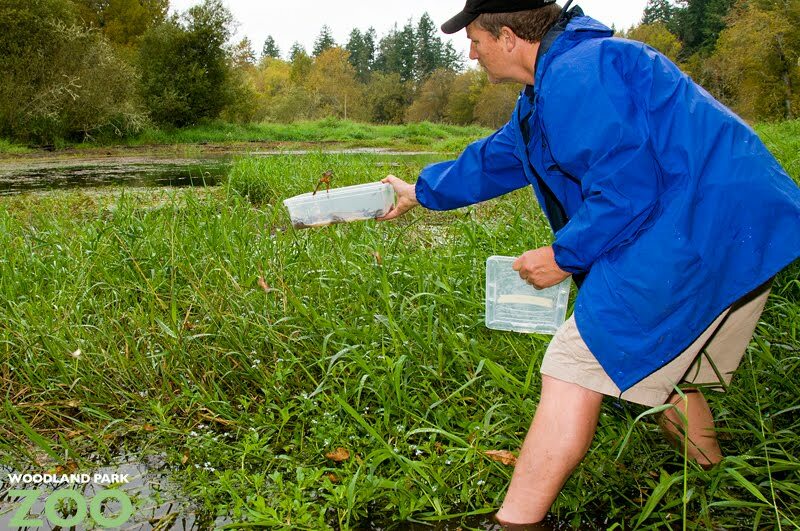 With native Oregon spotted frog populations decimated by 80%-90% in our own backyard, we’re committed to recovering their numbers and working towards a self-sustaining wild population. To help with that recovery, Woodland Park Zoo recently released 643 endangered Oregon spotted frogs into the wild. Reared at the zoo for the first months of their lives, these frogs took quickly to the protected lake where we released them, jumping right into their new environment. The work starts when Washington Department of Fish and Wildlife collects batches of Oregon spotted frog tadpoles and eggs from the wild and we rear them at the zoo for several months giving them a safe, predator-free home as they go through metamorphosis. 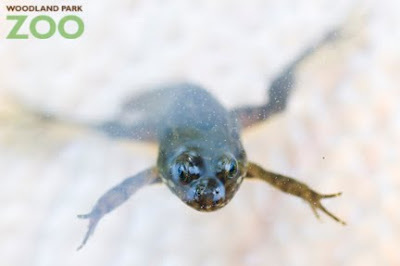 This year’s frogs arrived to us as tadpoles in April and May. Before release, the frogs are screened for health, measured and weighed, and some of them are tagged so that scientists can identify and track them over time once released into the wild. 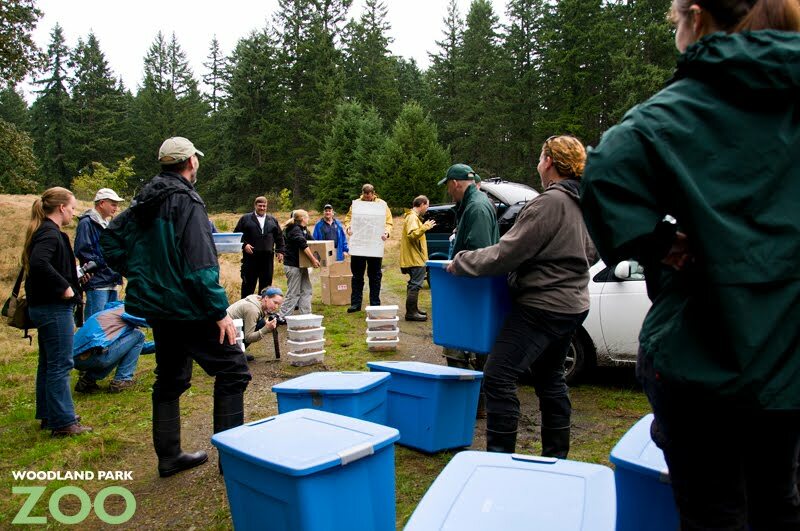 Joining efforts with other local zoos including Oregon Zoo and NW Trek, as well as Washington Department of Fish and Wildlife, we went out to a protected lake on the Fort Lewis Military Reservation in Pierce County to release a total of more than 1,300 frogs all together. As they grow and adjust to their new environment, we hope to see the frogs breed and establish a sustainable population on their own. Until then, we’ll continue headstarting the frogs here at the zoo and replenishing the wild population. But saving this species takes more—we need to monitor and mitigate the factors that have led to the endangered status of these frogs including habitat loss and pollution, and invasive species. You can help by avoiding the use of pesticides in your yard and reducing the pollution that impacts our local wetlands. The cycle continues this spring when we get a new batch of tadpoles or eggs and headstart the next generation of a species we hope will thrive once again in our beautiful Pacific Northwest. To get a powerful, independent-minded African lion to cooperate with its own daily care and veterinary check ups, keepers use ongoing training with positive reinforcement to make the animal a comfortable participant. In this video, lead keeper Anne Nichols takes 12-year-old African lion Kalisa through some standard training exercises behind-the-scenes at the zoo. 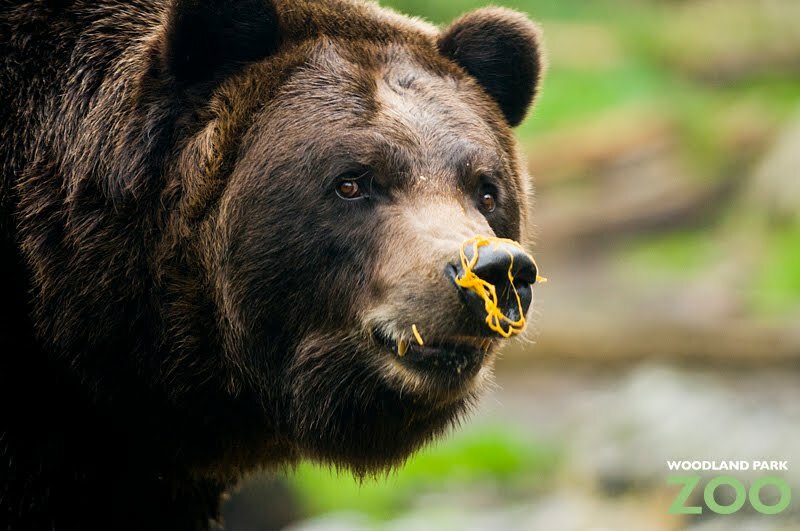 Video produced by Ryan Hawk, voiced by Anne Nichols/Woodland Park Zoo.